Long slim&comma; green bitter leaves with small yellow flowers. 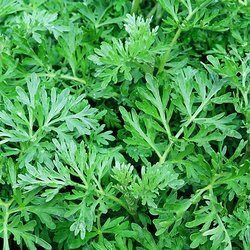 Wormwood is best known as an ingredient in absinthe and is used for flavouring in some other spirits and wines&comma; including bitters and vermouth. It can be used to help reduce indigestion and gastric pain and is also used as a superb insecticide without any harmful effects on bees and other useful insects.